Hello friend! I hope you’re having a fabulous week. The sun has finally shown her beautiful face here in Saskatoon and this week I had my first nap in my sunroom on my chaise lounge and the amount of people I’ve told about it is a little embarrassing. But seriously, it made me feel like Spring is here and with that comes my desire for less hearty foods and less inclination to turn on my stove. These brownies fit the bill perfectly! They are completely sugar free, getting all their perfect sweetness from delicious dates, which are packed with fibre and beneficial anti-oxidants. And even though they are sweet, they may help with blood sugar balance in diabetics. Adding a little pinch of sea salt to the recipe helps bring out the inherent sweetness in the fruit without having to add more sweetener. It’s a great trick to use in desserts! Walnuts and nut butter are a great source of plant-based protein, anti-oxidants, and some beneficial omega fats (when eaten in moderation). That means these little sweeties aren’t going to have as much of an impact on your blood sugar thanks to the great blend of protein, fat, and fibre! I don’t think I need to convince you of chocolate’s health benefits, but just in case you needed convincing, it’s a great source of magnesium, anti-oxidants, and deliciousness. In a food processor pulse together walnuts, cacao, and sea salt until desired texture is achieved. I like to leave a few chunks. Pour into a large mixing bowl. Remove dates from soaking liquid. Add dates, nut butter, and vanilla to food processor and blend until relatively smooth. You will likely have a few date chunks left. If they are not soft enough pour in a small amount of the soaking liquid (about 1 tbsp.) or add a little extra nut butter. Combine date puree and ground walnut mixture together then press flat onto baking sheet. Put into freezer for a couple of hours until solid. Cut into squares and enjoy! 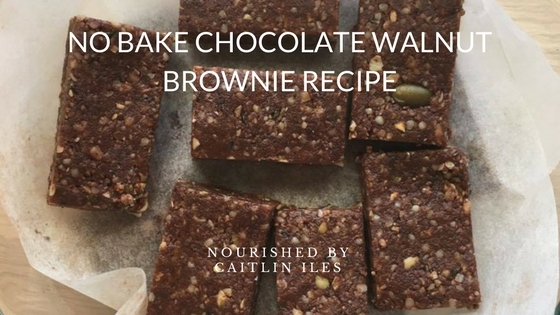 Well friend, that’s the super delicious, ridiculously easy, guilt-free brownie recipe for today! If you’re looking to take your smoothie game to the next level this spring then make sure you download my FREE Sensational Smoothies E-Book right here. I cannot download the free sensational smoothie e-book. I try but it will not download?? ?